FIGURE 6.2 Asexual spores produced by fungi. Structure to the far right is a sporangium that contains and is releasing motile zoospores (not to scale). Modification of Fig. 2.25 in ref. (2). Printed with permission from John Wiley and Sons. absorption to obtain their nutrition. They produce an array of extracellular degradative enzymes necessary to break down complex molecules from dead and/or living cells into simpler compounds that can be readily absorbed. As fungi colonize their substrate, spores may be produced via asexual or sexual reproduction. Spores produced via asexual reproduction develop as a result of mitosis without the fusion of gametes or nuclei. In contrast, spores produced via sexual reproduction involve the fusion of nuclei and/or gametes via meiosis. 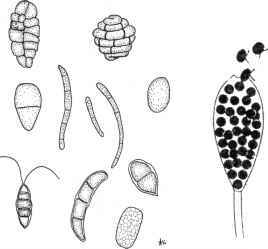 Examples of asexual spores include aleuriospore, chlamydospores, conidia, sporangiospores, urediospores, and zoospores (Figure 6.2). Asexual spores can form singly on a hyphal cell or form in groups into a specialized structure (e.g., synnema, sporodochium, Figure 6.3). Asexual spores can also be produced on hyphal cells in an enclosed or partially enclosed fruiting structure (pycnidium, acervulus, Figure 6.3). FIGURE 6.3 Fruiting structures associated with asexual fungal spores (conidia). Fig. 8.3 from ref. (2). Printed with permission from John Wiley and Sons. through recombination. 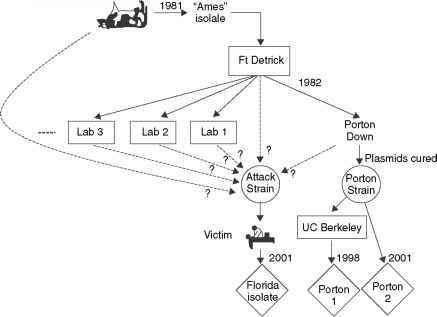 Fungi can also produce specialized structures such as microsclerotia or sclerotia (a compacted mass of melanized cells) to enhance their survival during periods of unfavorable temperature and moisture conditions. Examples of sexual spores include aeciospores, ascospores, basidiospores, oospores, sporidia, and zygospores. In general, ascospores are produced in a specialized fruiting structure called an ascocarp. 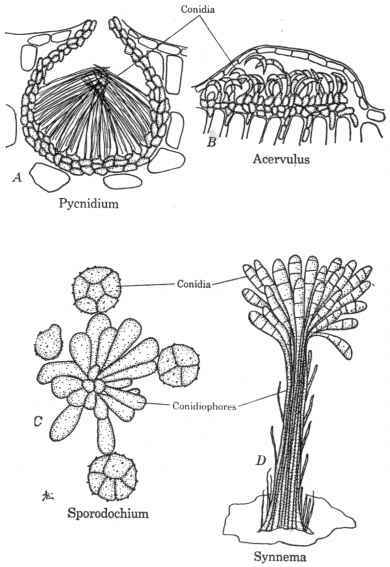 Four different types of ascocarps have been described: apothecium, cleistothecium, perithe-cium, and pseudothecium (Figure 6.4). However, some fungi in the phylum Ascomycota do not produce ascospores in an ascocarp. Basidiospores are produced on a basidium that is or is not enclosed in a fruiting body or mushroom (basidiocorp), while oospores and zygospores are usually borne directly on or in hyphal cell (Figures 6.5 and 6.6). For more detailed information see the websites by Tom Volk, http:// botit.botany.wisc.edu/toms_fungi/, and Kathy Hodge, http://biodiversity. uno.edu/~fungi/.